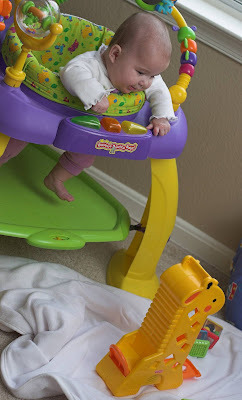 Yesterday, I placed Eleanor in her "Bounce Bounce Baby" exersaucer, and went into the kitchen to make a sandwich. I know, "Adult Supervision Required," but the kitchen in my place is about ten feet from the living room, and there isn't a wall. So, I felt pretty okay about it. Anyway, I was looking down making my sandwich, and I could hear Eleanor squealing and making ga-ga sounds. I thought, "Oh, she has finally come to realize the true entertainment value of her exersaucer, and she's having such a good time." Then, I looked up and saw that she was actually calling to her giraffe toy that Uncle Michael, Aunt Jen, and Chloe got her for Christmas. She kept reaching for it and grunting, as if at some point she would become Elasti-girl and be able to snag it. It's so funny how she latches on to one toy for a few days, and won't play with anything else. The great thing is by the time she's bored with one toy and ready for a change, she's completely forgotten about her other toys, so they appear exciting and brand new. Ahhh...the bliss of having no long-term memory!